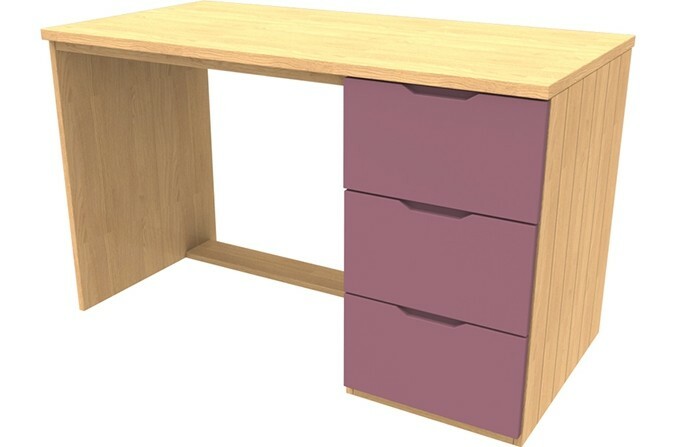 Painted with pink drawers (also available with grey or white drawers) this oak veneered desk is designed to match other furniture in the Savannah Collection. The oak laminate worktop creates an Ideal working space for teens or children to complete homework or exam prep. The three drawers on this desk are perfect for storing stationery and other items. Kids Pink Large Desk - Oak veneer frame available with Starlight Pink drawers, designed to match other items in the Savannah Collection. Lancaster oak laminate worktop with three painted MDF drawers and oak veneered tongue and groove frame. All drawers are set on metal easy glide runners for maximum durability.